The 12 apartments are located in three separate buildings in close proximity to each other. 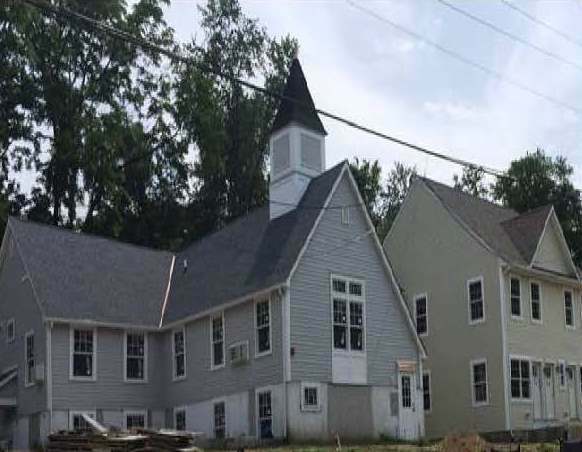 Two of the three buildings are new construction containing a total of 8 apartments; the third building is a recent conversion of vacant church into four apartments. They were designed by The Helms Group.The one-bedrooms range in size from +/‐ 572 sq. ft to 750 sq. ft. and the two-bedrooms from 892 sq. ft. to 1048 sq. ft. There is on‐site parking with 21 spaces. Antioch Homes is located in the Town of Bedford in the northeastern part of Westchester County. Bedford is approximately 17 miles north of White Plains and 40 miles north of Manhattan. The Town is bordered to the west by Mount Kisco, to the south by Armonk and to the east by Pound Ridge. Antioch Homes is in close proximity to shopping and entertainment. There is neighborhood shopping and business centers in the hamlets of Bedford Hill and Katonah and major shopping in nearby Mount Kisco, including a ShopRite, Kohl’s and Target along Route 117. Northern Westchester Hospital is located in Mount Kisco. The Katonah Museum of Art, John Jay Homestead and the Caramoor International Music Festival are cultural attractions in the Town. Antioch Homes is conveniently located off the Saw Mill River Parkway. There is commuter train service (Metro‐North Harlem Line) south to New York City or to points north of Bedford into Dutchess County. The Bedford Hills station is within walking distance of the apartments (0.21 miles). It is also served by the Bee Line Bus System Route 19 (bus stop is on Babbitt Road @ Buxton Rd which is walking distance) which travels south to Mount Kisco. The town’s Recreation and Parks Department offers swimming lessons at its three hamlet pools; summer camp, including a six‐week day camp for children with special needs; seasonal sports programs; and programs for seniors. There are three public libraries located in the Town, including the Bedford Hills Free Library. Community events are held at the Bedford Hills Community House. The Community Center of Northern Westchester is located in the Town. It offers computer training, basics of construction, and classes on how to start and manage a business and money management.